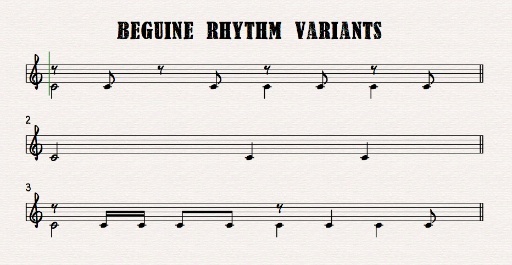 What is the beguine rhythm? I’m orchestrating a piece for guitar and orchestra with music by Kenny Burrell for a November concert. I have learned all kinds of new juicy suspensions common in jazz, and less so in classical traditions. One of the cornerstones of western harmony is resolving leading tones [do re mi fa so la TI has to resolve to DO!]. For Kenny’s piece, I feel too much like a goody-two-shoes resolving every leading tone as though it were Beethoven or Bach. I’m tending to let leading tones fall in this song instead. Notating the tune is a peculiar exercise, knowing that whatever I write down, even though it was mostly what HE wrote down on the lead sheet he gave me, he will always sing the tune a little bit different every time. This is true in most musical traditions, but faithful scribes seem to want to be faithful. As I write the string part, I find myself writing “string pads” — lush chords to support and not interfere with Kenny’s singing or guitar playing. I feel somewhat guilty not writing more challenging parts for them, but then this is all about Kenny: not about them. Evidently, the rhythm comes from a dance from the Caribbean, emphasizing beats 1, 3 and 4. The in-between stuff seems to vary. I’d appreciate any information on this rhythm, especially the first one. Cole Porter used this rhythm in many of his song as have many composers and arrangers. I’m not having much luck finding out the origins of this rhythm, but it may be called something else. Doing this orchestration makes my opinion of such masters like Vince Mendoza or Peter Matz skyrocket.